THE latest status report of the Union Ministry of Tribal Affairs on the implementation of the Forest Rights Act (FRA) of 2006 confirms the general perception that the law has not benefitted the majority of the country’s forest dwellers. 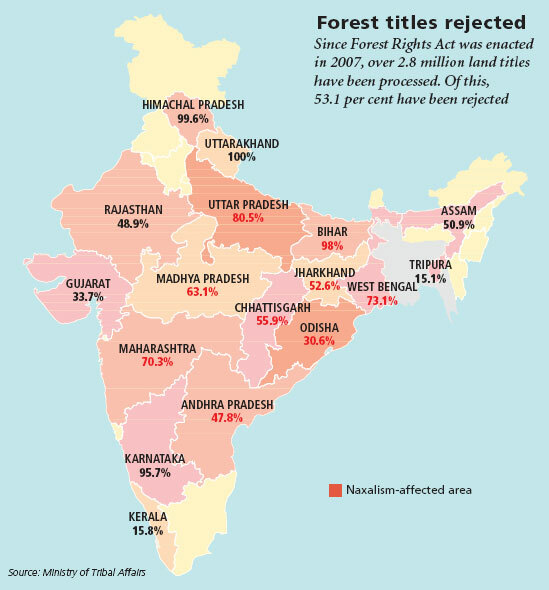 The report shows that more than half of the claims filed by the tribal people and other forest dwellers for land titles under FRA have been rejected. What’s more, though FRA has the provision for recognising rights for land parcels of up to four hectares (ha) to each legitimate claimant, the average size for which titles have been granted is only 1.4 ha. The status report, released in the first week of June, shows that 1.8 million ha of forestland has been distributed so far in response to 1,254,456 title claims. FRA was implemented in 2007 with the purpose of recognising rights of forest dwellers over forest resources. However, its execution has been plagued by many problems, including resistance from the forest department in ceding control over the resources. Of the 2.8 million land title claims processed so far, only 0.5 per cent recognise community rights over forest resources, while 46.4 per cent recognise individual rights over forest dwellings. Rest of the claims have been rejected. Community rights under FRA include the right to collect minor forest produce (MFP), like bamboo, which accounts for half of the forest department’s revenue. As per an estimate by a committee of the ministry of Panchayati Raj, the annual production potential of MFPs is about Rs 4,000 crore. But because of the unwillingness of forest departments to give up their revenue sources forest dwellers are working as daily wagers for the department or contractors. In the nine states affected by left wing extremism, 55 per cent land title claims have been rejected (see map). Two weeks before the release of the report, tribal affairs minister V Kishore Chandra Deo wrote to the chief ministers of forested states, expressing concern over poor implementation of FRA. He said that even after five years of enactment, the flagship scheme of the UPA has not benefitted the majority of the tribal population. The rejected claimants were not given any reason for the rejection nor an opportunity to appeal against it, he added. Recognition of community rights is low. As a result, large number of forest dwellers are facing eviction or harassment by forest authorities, he added. He asked the ministers to give “a clear signal” to the implementing authorities that “all rights of the forest dwellers must be adhered to and that the democratic process under FRA must be respected.” To remedy this, Deo sent a list of corrective measures to be taken for effective implementation of FRA. The list calls on states to constitute gram sabhas at the level of settlements or hamlets, instead of the panchayat level. The tribal affairs ministry is also mulling amendments to FRA and its guidelines. Last year in January, a committee led by former bureaucrat N C Saxena and Sonia Gandhi-led National Advisory Council had suggested modifications in FRA and its guidelines. They did not get immediate attention from the ministry of tribal affairs until Deo took over the ministry in July 2011. There needs to be a central registry by the tribal affairs minister which makes it convenient and cheap for all applications under the FRA to be made and monitored. 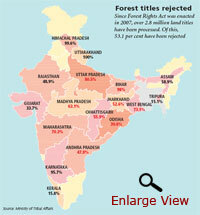 This would go a long way in implementing the forest rights act nationwide. and making such a registry operational is not very complicated or costly.